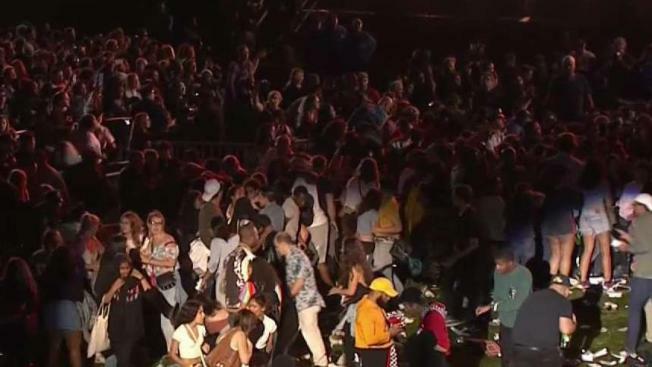 A barrier fell down at the Global Citizen Festival in Central Park on Saturday night, causing panic among the crowd. Thousands of people ran away from the stage with many of them crouching down amid unfounded fears of gunfire. Coldplay's Chris Martin came on the stage to calm the crowd. "Nobody is trying to hurt anybody," Martin said. "You're all safe, OK?" He pulled an NYPD officer up to the microphone who said a barrier fell down. The show continued minutes later with Cynthia Erivo singing "A Bridge Over Troubled Water." Then the show was halted again while police replaced the security barrier. The NYPD tweeted: "There were NO SHOTS FIRED at #GlobalCitizenFestival. The sound was a fallen barrier." Seven people suffered minor injuries in the commotion, said Hugh Evans, CEO of the festival. Many people lost their bags and purses in the chaos and police set up a lost and found at the precinct on 86th Street and Transverse Road. About 60,000 people filled the Great Lawn for the Global Citizen Festival. Performers included Cardi B, The Weeknd and Janet Jackson.